If you have already decided that the development of your business implies high level traffic and requires much more resources, definitely, it is time to lease the dedicated server. So, it is important to know all advantages and disadvantages of dedicated type of hosting before to make up your mind. Undoubtedly, dedicated server represents the best solution existing in the hosting market at the moment. On the other hand, its cost often presents an obstacle for small and medium-sized businesses that want to develop, but don’t have enough funds to afford leasing this powerful machine. 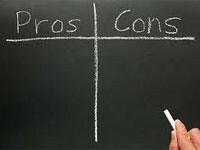 So, before to decide in favour of dedicated hosting, you should learn all its pros and cons. Dedicated hosting is exclusive top-level web hosting service allowing you to have the entire server at your disposal. This type of hosting provides you with dedicated IP address, tremendous amount of disk space and bandwidth as well as with high quality technical support. With dedicated server it is possible to install any software you want, additional applications and features and to manage the server yourself. But let’s have a closer look at this machine. Sure, dedicated type of hosting is considered to be the best solution offered by hosting companies today, but you should take into account several disadvantages as well. Cost. As dedicated hosting is much more expensive than shared one, so you should ponder over whether its cost will pay for itself at least in long-term perspective. Even if you don’t need so much server resources at the moment, but you want to make your site really presentable, you want to minimize the risk of downtime and you plan to have a multitude of visitors, you should choose dedicated server. But if your business isn’t planned good enough, dedicated hosting can turn out unprofitable. In this case you should set your choice on the shared server. Responsibility. Using dedicated server requires basic knowledge about server’s work as well as responsibility for maintaining and operating it. So, if you don’t have enough time or skills to manage the server you can choose more expensive variant of dedicated hosting – managed hosting. Manage hosting will allow you to rely on the team of professionals who will maintain your server.